It's what's inside that counts, but there's plenty for this Eton to shout about despite being on the bad side of chubby. There's an oversized amplifier that should, at least, provide a decent sound performance. However, a single mono speaker proves to be its downfall. The Sound 102 looks like it's come from the Apple design department and closer inspection reveals that its shiny whiteness is actually of even better quality. Sturdy and heavy, the 102's key selling point is the provision of a wired iPod dock. Attached to the back, the dock is of exceptionally high build quality, but the unit's simply enormous AC adaptor is a bit of a shock. A remote is provided that is the 102's exact opposite. Flimsy and short, we guarantee you'll lose it within the week. Autotune, which has to be done via the main unit, works in a few minutes and holds frequencies well without any need for the telescopic aerial, although there is an annoying delay of five seconds when selecting a DAB station. Switching between modes is a simple process, but sadly it can't be done using that teeny remote. It's doubly annoying because it's actually possible to operate an iPod from the remote control. Buttons mimicking the iPod are ring-fenced on the remote and allow access to the menus. There's also an auxiliary input in case you want to connect yet another device to this 'radio', as well as an audio output if you'd rather rely on better quality speakers. 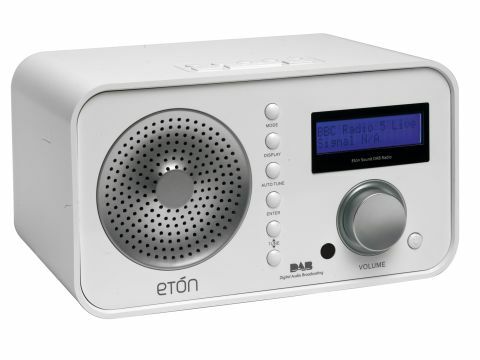 We've not seen such quality integration with an iPod from many other 'made for iPod' gadgets of late and - especially at this low price - Eton is to be commended. It's a shame, then, that the sound quality is lacking any kind of quality. Relying on a single mono speaker is criminal given the 102's lofty ambitions with iPod. Treble levels are set a touch too high and there's too little bass to get much from music. Worse still, there's no way to tinker with the sound levels, so you're locked into this annoying oversight from Eton. If your main radio diet is voice stations you'll find the 102 an excellent, high quality product, but we can't imagine that's the case for many owners of iPods - and given the radio's styling, iPod integration is surely the 102's main selling point. Given the average sound quality, this is a bedside radio at best and its also best avoided unless you really need to remote operate an iPod sat on a bedside table from the other side of a huge bed (which is unlikely). The 102 DAB is beautiful, but flawed, so we would advise saving your money for now. Keep an eye on Eton in the future, though: there's so much potential here that the second generation of the 102 with the problems ironed out could be worth waiting for.